Celebrity Make-Up Artist and Contestant of the new Lifetime TV Competition Series "Glam Masters" by Kim Kardashian-West and Diana Madison, opens a full service Beauty Lounge in Valley Village, CA. 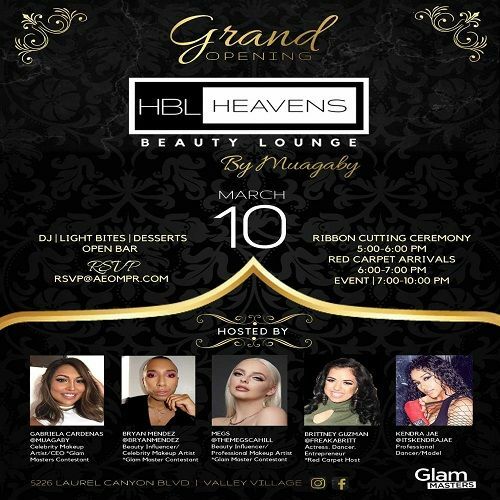 LOS ANGELES - March 6, 2018 - PRLog -- Celebrity Make-Up Artist Gabriela Cardenas, also known by many as MUA Gaby, and contestant of the new Lifetime TV Competition Series "Glam Masters, will open HBL Heavens Beauty Lounge, a full-service boutique-style salon in Valley Village, CA. Gabriela, is also the founder of Heaven's Beauty Academy LA and appeared on Season One of the popular show, Revenge Body. The star-studded Black Carpet Celebration will be held on Saturday, March 10th, 2018 at 5228 Laurel Canyon Blvd, Valley Village, CA 91607. The event will be hosted by Celebrity MUA Contestants, Gabriela Cardenas, Bryan Mendez and Megs Cahill, of the Competition Series "Glam Masters" Exec. Produced by Kim Kardashian-West and Diana Madison. Additional hosts include, Actress/Dancer Brittney Guzman and Dancer/Model Kendra Jae. The festivities and will include a Ribbon Cutting Ceremony at 5:00 PM, Black Carpet Arrivals from 6:00-7:00 PM and the event will begin 7:00 PM-10:00 PM. Attendees will enjoy Lite Bites, Desserts, Gift Bags and an Open Bar while mixing and mingling with celebrities, industry professionals and special invited guest. Music will be provided by Robert Delorbe aka DJ Darky. For information about HBL Heavens Beauty Lounge services or to make an appointment call (818) 452-0461 or visit http://heavensbeautylounge.com . Celebrity Makeup Artist, Public Figure, CEO & Entrepreneur Gabriela Cardenas has been in the beauty industry for 17 years. You have seen her work grace the runways, TV, Film and red carpet, working with celebrities such as Rosie Perez, Tia Mowry, Paris Hilton, Paula Abdul just to name a few. Currently, you can catch her on the Lifetime TV Competition Series "Glam Masters" by Kim Kardashian-West competing in her specialty craft. She has also appeared on Season One of Revenge Body with Khloe Kardashian on the E-Network. Her passion is to make every person she comes across to feel like a celebrity.